The purpose of lessons learned is to bring together any insights gained during a project that can be usefully applied on future projects. Everything learned from previous projects, whether they were successes or failures can teach a project manager important lessons. And individual project managers usually do learn from their own previous experiences, but are these "lessons learned" shared with others within the project team or within the same organization or with the broader project management community as a whole? 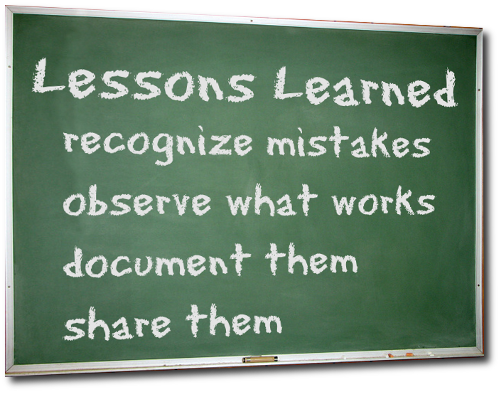 Capturing lessons learned from projects is key for any organization. Unfortunately, project teams are usually moved quickly from project to project and capturing lessons learned is never a priority. To ensure efficiencies over time and development of best practices, it is essential to capture lessons learned on your projects. Now the flipside to capturing lessons learned is ACTUALLY UTILIZING lessons learned in future/present projects! I have been working in formal project management for over 13 years now and have yet to come across an organization that actually looks at lessons learned captured from previous organizational projects while kicking off or initiating new projects. Why organizations/PMOs and those who adopt PMI methodologies or require PMPs dont utilize Lessons Learned repositories is beyond me. It becomes very frustrating with high project failure rates to be in senior management and see issues arise that could have easily been avoided if they would have been mitigated early on from the knowledge gained of Lessons Learned from previous like/similar projects. But organizations and PMOs should not be the only ones on the hook for this epidemic that further leads to high failure on projects. Project Managers themselves need to take some blame too. Share your career portfolio project lessons learned in a blog, article, web site or your next networking event. Maybe a great project that PMI, Prince2 or any other advancement of project management organization can do is create a global project lessons learned database. This database can accept and catalog lessons learned from project managers globally on projects of any kind. Organizations globally could/should contribute to this for the simple fact it will help them first and foremost but also help projects globally and investment of dollars lost into additional projects and the benefits of those projects. http://www.zdnet.com/blog/projectfailures/worldwide-cost-of-it-failure-6-2-trillion/7627 - according to this article from 2009 the cost of IT Project failure globally is $6.2 TRILLION!!! $6.2 TRILLION!!! Imagine a world where we could learn from these mistakes, and mitigate these project pitfalls early. Money that could be invested in infrastructure, innovation and new capabilities worldwide. Its time for project mangers, organizations, and PMOs to start really documenting/using lessons learned to help deliver more projects successfully while avoiding the sins of the past. pretty interesting thought. I wouldn't have said it any better myself. great choice of words.